Starting with a new marketing approach can be an adventure, but email marketing has been used for many years and has a track record of being successful and often indispensable for creating brand awareness and getting your message across. Let’s take a look at why it is a good idea toapproach your target audience via email, how you should get started and which do’s and don’ts you should look out for. When you set out to reach your target audience through email marketing, it doesn’t stop at computers as almost everyone owns a smartphone, and tablet sales are still on a rise. This means that you can reach your target audience through more than one device, increasing the chances of them paying attention to your message as they, for instance, will be able to read your email whilst waiting at the busstop during which they have time to invest as opposed to at work or at home when they have other distractions and obligations. Studies show that in the US more than 50% of mobile phone owners read their email on their phones, which is great news as it means that you don’t have to invest in creating an app or some other form of mobile based technology because you can simply email them instead. Of course you could target mobile phone users through text but that would leave out all other devices, limit your customisation options and of course: cost you a heck of a lot of money! An email can be completely customised to match your message and brand. Not only will a branded email look more professional, it will serve as a great brand recognition source if done correctly and tailored to suit your brand image. This doesn’t need to be anything fancy, but should contain your logo and be consistent with the rest of your branded items and content like colours, fonts, imagery and tone of voice. Creating a template that you can use for all emails is advised to help you save time and avoid any inconsistencies that might occur when starting from scratch. Not at all unimportant is your tone of voice. Email marketing allows you to communicate directly with your target audience, which means your text content needs to be as good, if not better, than the imagery. This is your chance to show your company’s personality and relate to your audience through conversation. Use this channel to keep your customers up to date on all things surrounding your company and inform them of any offers or discounts that you have. You will stay relevant by staying active through email and letting your audience know that you’re thinking of them. Email marketing is very sufficient in integration as you can automatically embed people’s names, add personal messages, suggest products that they might like as well as prompt them to continue their payment process if they stopped half way. This sounds like a lot of work, and it would be if you had to do all the programming manually but that isn’t the case. There are multiple online email marketing services that can do most of the integration work for you and some, like MailChimp, even analyse your email marketing message performance for you by creating a neat overview of statistical data per sent email and per individual. Another benefit of using an online service like MailChimp is that it provides you with a step-by-step tutorial on how to create a campaign, manage your subscription lists and more. Also, due to the large amount of online service tool users, there are manuals and how-tos on practically any problem you may run in to. 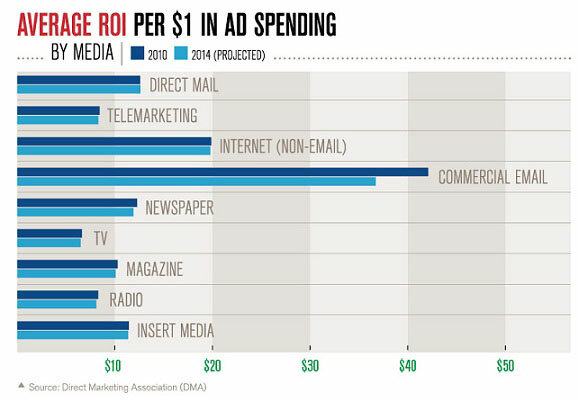 Compared to most other marketing methods, email marketing is very inexpensive. Of course the cost varies from company size and amount of emails sent, but at a few cents per email it is worth the investment due to the proven high ROI. This inexpensive marketing tool is especially useful for small businesses and startups with a small advertising budget. Email marketing might be seen as something ‘old’ but although it has been around for a long time, it doesn’t mean it isn’t effective anymore. New doors are being opened for the marketing tool due to technological innovation and your business is sure to benefit from communicating through this channel. If you feel ready and sure of getting stuck in to email marketing, go for it! I am sure you won’t be disappointed. If you are interested in learning more about the online email marketing service: MailChimp, check out It’s All About MailChimp! Use this blog to the max! Stephanie Varga on Try out the best All-You-Can-Eat-Sushi in Utrecht! Jacquie on Try out the best All-You-Can-Eat-Sushi in Utrecht! Stephanie Varga on Get energized! Tips for recovering fast.